The Father of Killers waits for his charge, eager to learn whether this son has succeeded in his mission, his mark left for dead behind him. Forest has performed his task well, but the next one will be far harder, in many ways. Is it loyalty to one’s brothers or following orders that is more important? Waylian is lost, alone, freezing in the snow, his supplies running low, and as if things weren’t bad enough fangs and fur come flying towards him; a beast more hungry than he himself. Regretting his mission, and with no other choice, he sacrifices the last of his food and runs, hoping he has enough left in him to flee this newest enemy. Janessa now wears the Steel Crown, whether she wanted it or not. She still does not feel ready, or right for this great role. From Princess to Queen, she did not change overnight; except in title. 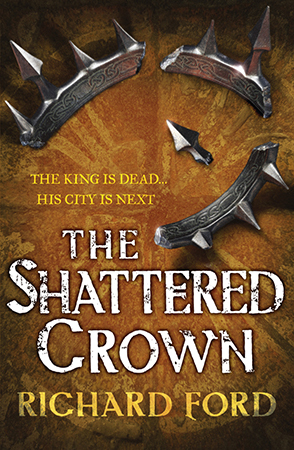 She is trapped in Steelhaven as Amon Tugha’s army draws ever closer, their goal: to attack and destroy her home and her kingdom. But as she will learn, the attack does not just come from beyond Steelhaven, but from within its gates too. Book two of the Steelhaven series follows the characters that were built up so well in Herald of the Storm to continue the story as the enemy approaches and consequences begin to play out. Ford tells his tale waving the same magic as the first book in the series, pulling the reader into the intricacies of the plot and cloaking them in the mysteries of another world. 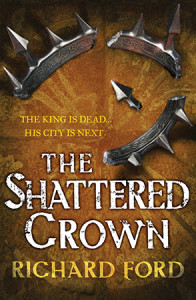 The vast cast of colourfully depicted characters, well-handled violence, and political manoeuvres make The Shattered Crown as enjoyable as book one. 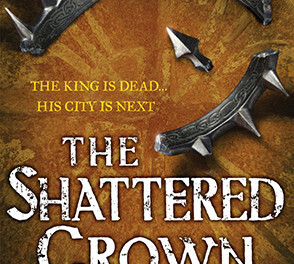 Ford has proven that this series deserves to sit among the best fantasy series of recent times, and with the end of this instalment, book three looks set to deliver a truly epic conclusion to a worthy story.